Creating the Creature Compendium has been some of the most fun I’ve had making SagaBorn books. It combines many things, so it means I have to constantly multitask. Which is something I enjoy. In fact, I think it may be one of my strongest creative boons. And one of my strongest drawbacks. I have had to admit that I am not good at sitting behind a canvas and painting for 8 hours straight. But while working on the creature compendium it means equal art, writing, gaming, and research. It is taking all sorts of art; conceptual, pencil work, and some painting. Normally my art process is come up with a concept, then layout, shoot models, and paint. All taking up often a month or more. But this is a constant change of pace, switching up what I do each day, and it is wonderful. The past week I have drawn 9 new creatures. 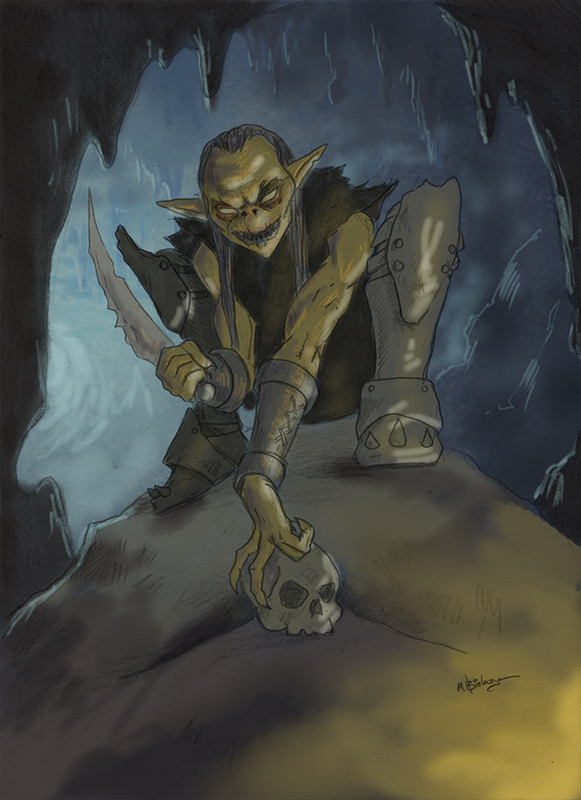 Today, I decided to paint a goblin rather than draw him. And this has kept everything so fresh. I think everyone is going to enjoy the Creature Compendium just as much as I do, and I can’t wait to get it out! I’ll be posting the CC Kickstarter soon, so keep your eyes open. Next Some rule clarifications, via a questionnaire from Sam Flegal. Previous The Evertide RPG coming in 2019!